Card / U-key Dispenser (optional): Card box capacity - with card thickness of 0.76mm, convex word card: 70pcs, flat word card: 100pcs. Support dispensing IC cards & magnetic cards; U-key box capacity: up to 20 U-Keys (U-key box size: 100mm x 80mm x 20mm). Financial modules of magnetic card reader, IC card reader and RF card reader etc. are highly integrated and can be removed or replaced; multiple types of printers are supported. Integrated with face recognition and fingerprint identification functions to do fast and accurate identification of visitors. 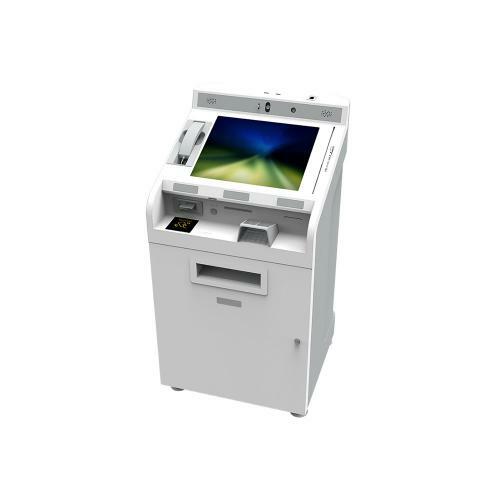 All operations can be done on the touch screen; text information input supports hand- writing or analog keyboard. Integrated with comprehensive financial infrastructure technology modules.